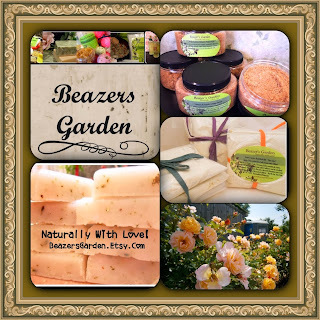 BEAZER'S GARDEN EARTH MONTH/ MOTHER'S DAY SALE! 30% off all orders (min $15) with coupon code GREEN until May 3rd, the last day to order for Mother's Day Shipping. Does your shop have coupon codes? Ipost them every Monday, send me a link! I do! 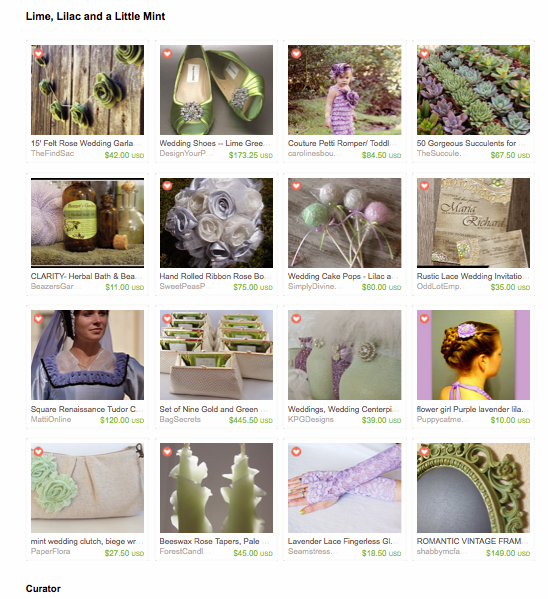 Especially in these items from handmade and vintage Etsy shops, like my herbal bath soaps, ceramic pitcher and flower photography. Curated by wilma van aschfrom constarlation, an Etsy shop specializing in prints on everyday items like bags, posters and things for the home. Curated by Mary Jfrom HipAndHail, a shop featuring handmade hair accessories. Mary writes... "Inspired by earth day. Inspired by my children as I wish to help leave this world in as good-a-shape (or better) as it was when I entered it." Take 30% off your purchase in my shop with code GREEN until 4/27! 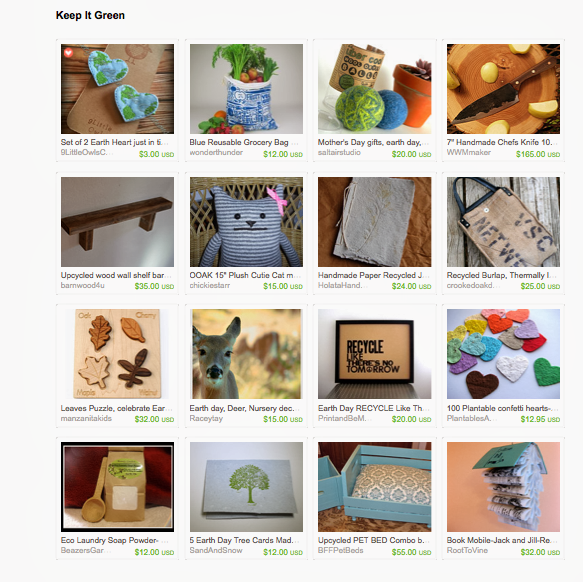 A soft green palette of items from the Wedeclectic team on Etsy. My bath & body oil, lovely succulent plants and clutch purses make great gifts for a bride or her wedding party. 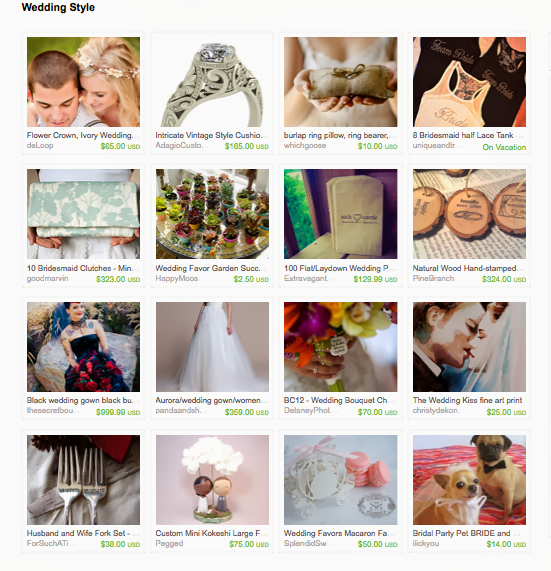 Brought to you from Karenfrom BlingForTheTable an Etsy shop featuring beautiful wedding or party day table settings. "A bright pop of orange doesn't have to mean autumn." 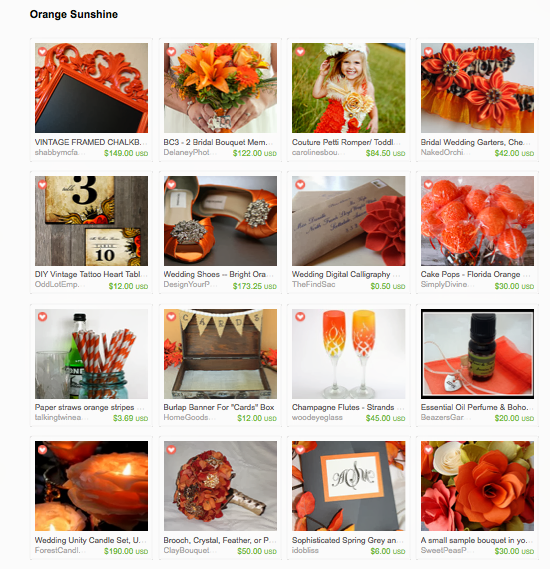 A festive collection of gift items like orange striped paper straws, bridal bouquet charms, and my Boho Essential Oil Necklace Set (Take 30% off until 4/27)! Brought to you from Karenfrom BlingForTheTable an Etsy shop featuring beautiful wedding or party day table settings. 30% off all orders (min $15) with coupon code GREEN until 4/27. Give your sweetie (or yourself) a gift of natural herbal goodness! If only computers had scratch and sniff technology for you to smell the yumminess! One of my favorite new calender events! We needto pause and recognize our interdependence with nature. Since the first Earth Day in 1970, concerned people around the world have found ways to reconnect with our responsibility to be stewards of the planet. Now-a-days it's very easy to find ways to be kind for the health of the planet and ourselves. The two ways I reconnect is through my products and my work in environmental education. 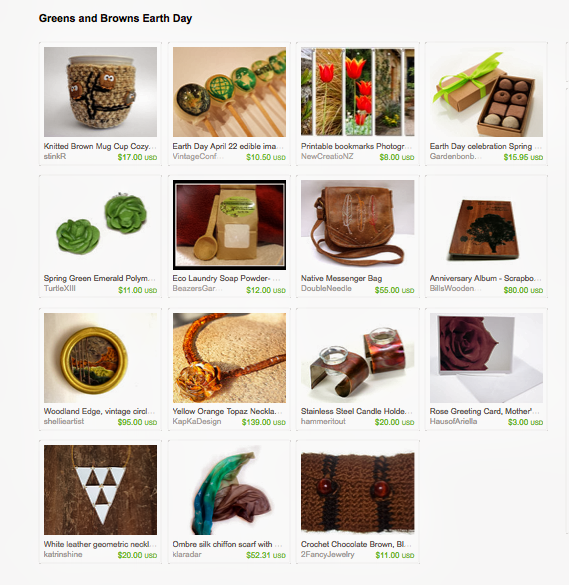 In honor of Earth Day, I'm posting a Treasury (usually on Thursdays) today! The basic components to a functioning compost system are the idea behind these great items in this treasury. (They probably were not directly inspired by compost but let's pretend for Earth Day!) Featuring items that are handmade and all natural like my laundry soap powder, and vintage or gifts made from re-purposed parts, any of these items would make a tree huggin' greenie proud! 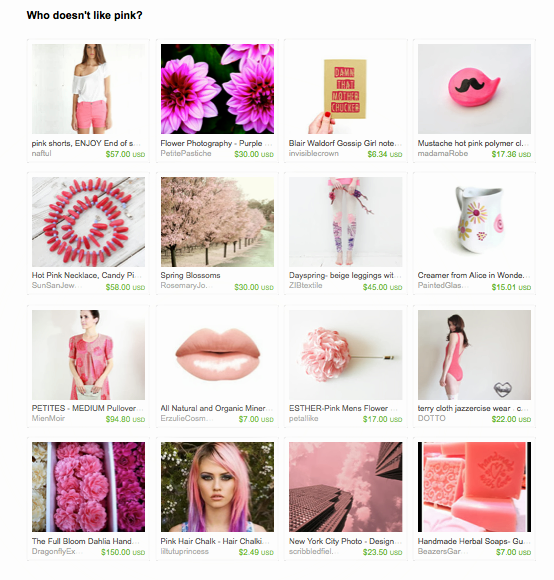 Check out some other shops from Etsy this week while I get ready for my Mother's Day posts! Enjoy! BijiBijoux Handmade beaded jewelry Necklaces, bracelets, earrings and Anklets. Also selling supply for making jewelry. USE COUPON CODE sat10 FOR 10% OFF ON ALL ITEMS $50 AND UP.THE COUPON CODE DOESN'T COMBINE WITH THE BULK PRICING OR the 10% off already SALE SECTION PLEASE. FREE SHIPPING on items $50 and over. Butterflies are urban canaries indicating diverse natural habitats that support all sorts of beneficial pollinators. No butterflies equals poor urban habitat. Only one or two sightings or species means the habitat is lacking in many of the elements needed to support a diverse community. Here’s how to create a Butterfly Park in your backyard or community garden. §A Butterfly Park is an area planted in a sunny spot in your garden to attract butterflies (and other pollinators) filled with a variety of native perennial nectar and host plants. §Sure, you can plant annuals and sunflowers in a Butterfly Park. Just remember you will have to replant or replace annuals every year. §Most native plants will tolerate weather conditions in the area and may be drought tolerant. You should, however, mulch the Butterfly Park to help retain water and keep the weeds down. Beazer's Garden FREE SHIPPING! Use thiscode "CUSTOMERVIP" and get your items shipped free to you this week only! If you are a crafter and have coupons you would like to share, please send me a link and I will post them here and send out through stumble, twitter & Facebook! It started with love...a little bit of everything to make it a special day. Enjoy! April is Earth Month, an expansion on the action-orientated principles of Earth Day, which was conceptualized in 1969. The basic idea is to protect our environment by being aware and conservative in our use of resources. This can take many forms, from eating healthy through local sources, supporting businesses that promote sustainable practices and realizing the options available to us as consumers. When I'm cleaning my home, I cringe every time I have to dump a bucketful of chemical filled dirty water down the drain, knowing it could end up in our water system. Though most of our water gets treated to remove harmful particles before we use it again (our water is a process of recycling ya know), sometimes the water doesn't make it to the treatment plant. Sometimes, due to poor city infrastructure, it gets washed back out into our waterways during a heavy rain or seeps into the ground in our communities or overflows into our streets from clogged sewage pipes. We asked our Facebook fans what they would do with mesh produce bags from the grocery store once the produce is gone. These little bags, which hold clementines, apples, brussels sprouts, and more, are too cute to throw away. Here are some genius ideas our crafty fans came up with for ways to reuse mesh produce bags. We love crafts using recycled materials! In this free eBook, Jewelry for You! How to Make Handmade Beaded Bracelets and Necklaces, you can learn how to make jewelry, from bracelets to necklaces and even earrings. Making jewelry has never been easier - Consumer Crafts and Crafts Unleashed partnered with FaveCrafts.com to provide you with over 30 pages of photos and directions for making beaded jewelry. Sprinkled throughout the pages are tips for making beaded jewelry to ensure your success your first time. You'll love making handmade beaded necklaces and making beaded bracelets, especially if you're a fashionista who loves the jewelry you see in the stores but doesn't love the price tag. Download your copy of Jewelry for You! How to Make Handmade Beaded Bracelets and Necklaces Free eBook with 22 free beading patterns today.